The Homeland Security Enterprise has been focused, appropriately so, for the past three weeks on the preparation and response to Hurricane Florence, the White House release of both the National Biodefense Strategy and the National Cyber Security Strategy, and the commemorative events on the 17th anniversary of the 9-11-01 terrorist attacks that led to the creation of the Department of Homeland Security. That is why significant proposed changes at DHS S&T might have been overlooked. 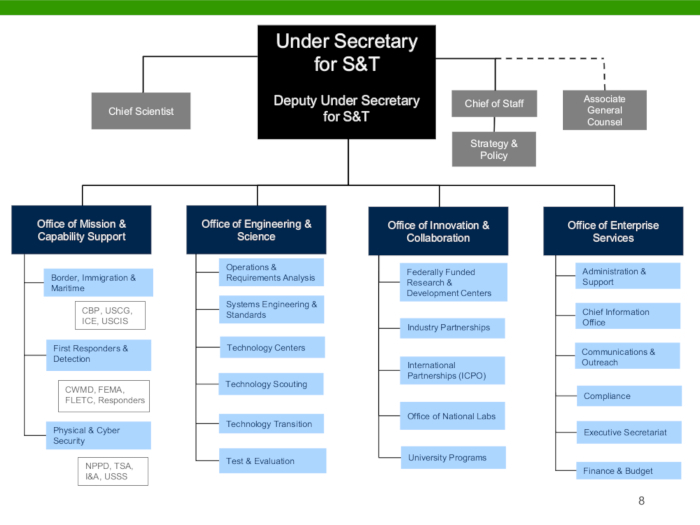 Dubbed the S&T “Revitalization,” the changes announced by S&T Under Secretary nominee Bill Bryan (currently the SOPDUSST – yes, that is an acronym) at a recent S&T “All Hands” meeting and a subsequent HSSTAC web-meeting, lay out Bryan’s vision for a new S&T operational model. The purpose of the new structure is to “operationalize” S&T’s research and development mission by realigning the structure to match up with the missions of DHS’s other components and move away from conducting “science experiments” which were not specifically requested by S&T’s customers – which he defined as DHS operational components. Bryan and an internal S&T team have been working on this revitalization effort since the first of the year. S&T employees cannot complain that their views weren’t requested. They were. It was well understood that offices would be eliminated, created and significantly changed from what they were. Bryan made it clear that he believed the changes were necessary to better align S&T with the evolving DHS mission and the changing tactics used by those who seek to terrorize America. There were multiple opportunities for employee “input,” yet it was only in the past few weeks that there were any hints as to what the “output” of those discussions might entail. That is to be expected, I suppose, when there is change affecting a high percentage of people in any organizational realignment. Yet, the length of time it took to get final approval from DHS headquarters created a lot of unnecessary angst. Unfortunately, I can find no evidence where private sector stakeholders and other interested non-governmental parties were asked to provide input on the new organization and, in my opinion, that was a giant mistake. To those of us in the private sector who believe that DHS S&T has an important role to play in keeping America safe, a “revitalized” S&T sounds like a good thing. If DHS S&T is going to go the route being followed by DOD, where the expectation is that basic research and development will occur in the private sector, the decision to shut private sector stakeholders out of the revitalization process was ill-advised. While the new organizational model has been announced, it has not yet been cast in stone, and that is a good thing because there are several questions that should be answered before the org chart is finalized. First, and the easiest to address, the mission of the Office of the Chief Scientist needs to be defined more clearly and communicated to internal and external stakeholders. Having a Chief Scientist report directly to the Deputy and Under Secretary, as Bryan has proposed, may make sense. Yet, not one of the four new S&T Offices, including the Office of Engineering and Science, will report to (or through) the Chief Scientist. This disconnected alignment runs the risk of giving the impression that the Chief Scientist’s position is more figurehead than functional. Further clarification is in order. Second, and perhaps more important, is the way the revitalization all but ignores the one program at S&T that has the greatest private sector impact of anything S&T does – namely, the Office of SAFETY Act Implementation (OSAI). Even if our firm did not do SAFETY Act work on behalf of clients across the country, which in the interest of full disclosure we certainly do, I would still feel strongly that this program deserves a bigger seat at the table. OSAI has helped private sector companies develop and deploy anti-terrorism products and services, thereby saving the government billions of dollars of R&D money. OSAI should not be buried so deeply into the newly revised S&T org chart that is isn’t even listed! There are numerous examples of how going through the SAFETY Act evaluation process has driven private sector technology innovation and creativity in ways that government bureaucracy could never accomplish. SAFETY Act approved technology—which OSAI has deemed through rigorous evaluation to be “effective” for what is was designed to do—has protected hundreds of thousands of Americans and multiple billions of dollars in economic activity and the program keeps getting better each year. Yet, if someone listening to a member of Congress or to the DHS Secretary talk about the benefits provided by the SAFETY Act wanted to know where to find OSAI within the new S&T reorganization, they could never find it! This would seem to be a no-brainer, but Mr. Bryan and the S&T revitalization team need to correct this error in judgment immediately. A program that has the highest levels of positive visibility at the top levels of DHS should not be ignored, either in reality or in perception. These are only two of the many questions being asked since the new structure was announced, and there is much more that S&T should do to explain the impact of these changes. Let’s hope that a newly revitalized S&T accomplishes the goals Bryan has articulated. There is much to commend in giving S&T a relatively new start. Even in the midst of change, S&T needs some stability at the top (it is past time for the Senate to confirm Bill Bryan as the permanent Under Secretary, by the way), and it needs to be given some time to let the new alignment, which is supposed to be effective on October 1, have sufficient time to establish itself. Change in any organization is never easy because it often involves requiring people to change what and how they perform their tasks. The best change agents, according to reports in the Harvard Business Review, effect change by explaining “why” change is occurring. When that occurs at DHS S&T, the probability of the new revitalized organization’s success will be more likely. Until it does occur, however, questions will remain that these changes may not have the positive impact that Mr. Bryan and DHS want or that the nation deserves.